Discount information has just been released for Tables in Wonderland members. Soon members will be able to book 2011 Epcot International Food & Wine Festival seminars and demonstrations at a discounted rate. Early booking will be available starting at 9 a.m. 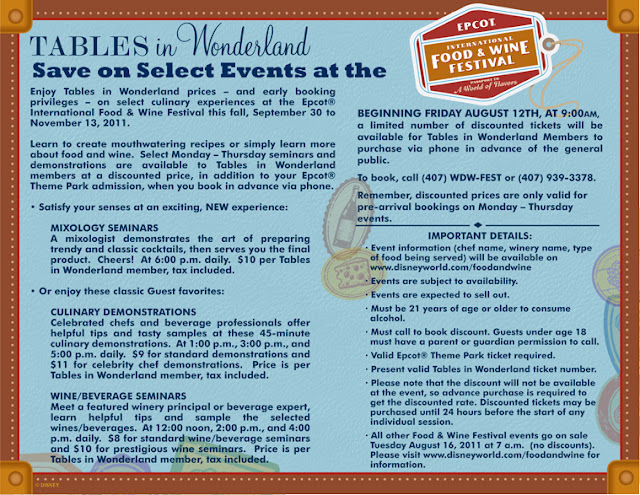 ET on August 12, 2011 for Tables in Wonderland members and Annual Passholders. These demonstrations and seminars will be taking place Monday-Thursday during the festival. The official booking date for all events is August 16, 2011. To book, call (407) WDW-FEST. Mixology Seminars: A mixologist demonstrates the art of preparing trendy and classic cocktails, then serves you the final product. Cheers! At 6:00 p.m. daily. $10 per Passholder, tax included.